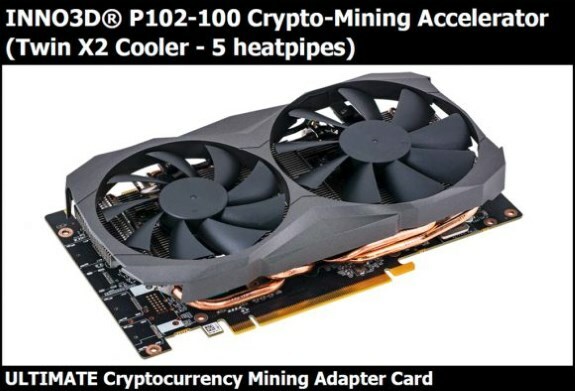 Specifications appeared of a new NVIDIA GPU that's designed specifically for cryptocurrency miners. The P102-100 is based on the same chip that's used the for GeForce GTX 1080 Ti and GTX Titan Xp, but it has fewer shaders, a smaller memory bus and a lower amount of GDDR5X memory. The chip is optimized to deliver similar hashrates at a lower cost. The P102-100 has 3200 CUDA cores, a 1582MHz base clock, 5GB GDDR5 memory clocked at 11GHz, a 320-bit memory bus, 400GB/s memory bandwidth, and a 250W TDP.